Apparently, it is one of the most popular Yotam Ottolenghi’s recipes – and rightly so…. A few tweaks to the recipe, though. Onions were replaced by leeks as one of the mobile calorie intake units guests is allergic to it. Fresh figs were replaced my dried ones, due to sourcing and budgetary constraints. Probably not the dish Yotam envisioned, but still… it is a pretty good way to start your Autumn. Preheat the oven to 240oC/220oC Fan/Gas Mark 9. To make a balsamic reduction, place the balsamic vinegar and sugar in a small saucepan. Bring to a boil then reduce the heat and simmer for 2–4 minutes, or until it thickens. Be sure to remove the pan from the heat when the vinegar is still runnier than honey; it will continue to thicken as it cools. Stir in a drop of water before serving if it does become too thick to drizzle. Arrange the sweet potatoes on a serving platter. Heat the remaining oil in a medium saucepan and add the spring onions and chilli. 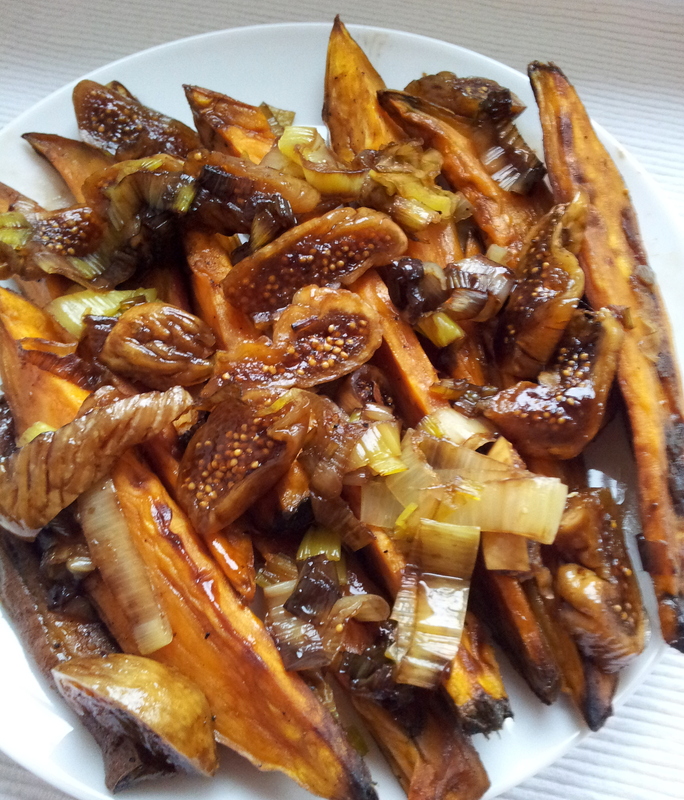 Fry on a medium heat for 4–5 minutes, stirring often, making sure not to burn the chilli, and then spoon the oil, onions and chilli over the sweet potatoes. Dot the figs among the wedges and then drizzle over the balsamic reduction. Serve at room temperature.